You would think that traveling by myself would mean I'd finally have the freedom to do things the 'right' way and not worry about what others were doing. But on my latest work trip I was traveling solo and found myself suddenly worried about the amount of trash that was going to be created during my hotel stay. It's not to say that Hubby doesn't care about being environmentally friendly or zero waste. He does his part on recycling, refusing plastic bags and being a good steward of the Earth. It's just that it isn't on the forefront of his mind. While we may not be 100% zero waste at home he helps me realize it's all about balance. With him not there to take the blame on this trip all waste created would be on me. This past year I've stayed in several hotels both for business and pleasure, and I can tell you they can vary widely in the amount of trash they set you up to use. Call ahead and ask questions about their set up. Hotel websites are great for information about amenities, but not if they have plastic cups in the bathroom. 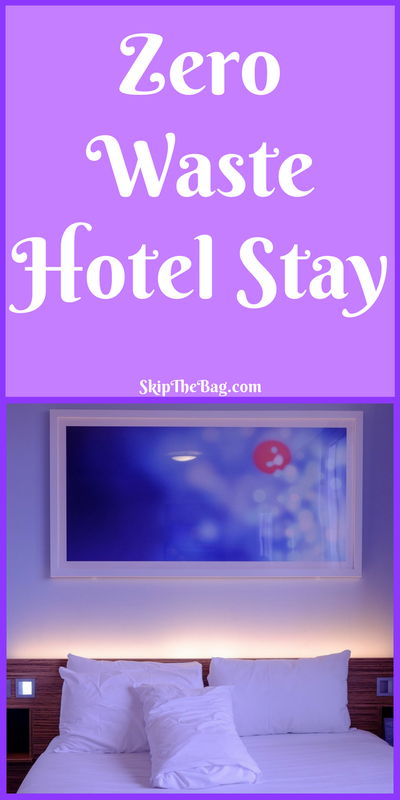 But if you don't have a choice in where you stay here are some ways you can try and mitigate waste. fund the blog, but the price to you remains unchanged. Most hotels offer little travel size shampoo, lotion and hand soap. These smaller sizes have a much smaller plastic:soap ratio, so you are better off just trying to avoid using them. The best way to avoid using them is to bring your own. I personally carry a shampoo bar* while traveling. As a bonus, since it is a solid it doesn't count against your liquids for carry on luggage if you are traveling by airplane. At home I'm using apple cider vinegar for conditioner right now, but while traveling, I usually bring my conditioner bar* since again it avoids carrying luggage. Either can substitute for hand soap. Finally, I do usually carry some coconut oil for face wash or moisturizer. Often there are cups in the room. If you are lucky they are glass cups, but it is frequently plastic cups wrapped in plastic. If you are in a hotel that provides the later, do not touch the cup! :) Ok you can touch it, but hopefully you already have a water bottle* so you can just use your own. Coffee. Bring your own travel mug (hubby's favorite*) and get it filled from the restaurant. Ask what kind of coffee makers they have. For one conference I had a friend who brought her own hot pot to boil water, coffee and mugs. It was less waste to do it that way, but you have to have room in your luggage. Ok, so this isn't as much about waste as it is conserving resources: don't change the laundry. You don't change your sheets or towels every day at home, so why do it at the hotel? Keep them for as long as possible.Some places have things like hanging towel = keep, towel on the floor = change. Others have signs that you put out to alert the house keeping staff you either want to keep your towels or swap them out. I usually just put up the privacy sign to prevent housekeeping from coming in at all. Hotels frequently use keys with re-programmable chips in them. They are the size of a credit card and either need to be inserted into the card reader or tapped on the card reader. Be sure to return the key to the front desk as you are leaving. They can reuse the keys over and over again and they don't have to be trashed. We stayed at a hotel that a hotel buffet with disposable everything: "paper" plates and plastic cups and silverware. It drove me crazy. So I would first advise you ask about amenities before booking the hotel. If you don't have that option, then bring your own. You do have your silverware kit, right? Of course you can always try to minimize waste by scoping out the buffet for package free getting fruit or other package free options. Room service typically will be served on real dishes, but it can be more expensive. You can always bring snacks from home or go grocery shopping or eating at restaurants that use real flatware and silverware. I was able to approach my hotel stay with relatively little waste created. I had most of my meals at the hotel restaurant, but did get a few coffee mugs from the hotel Starbucks. I'm not normally a coffee or tea drinker, but those early mornings of long lectures I needed it. So I'm pretty proud of how things went. 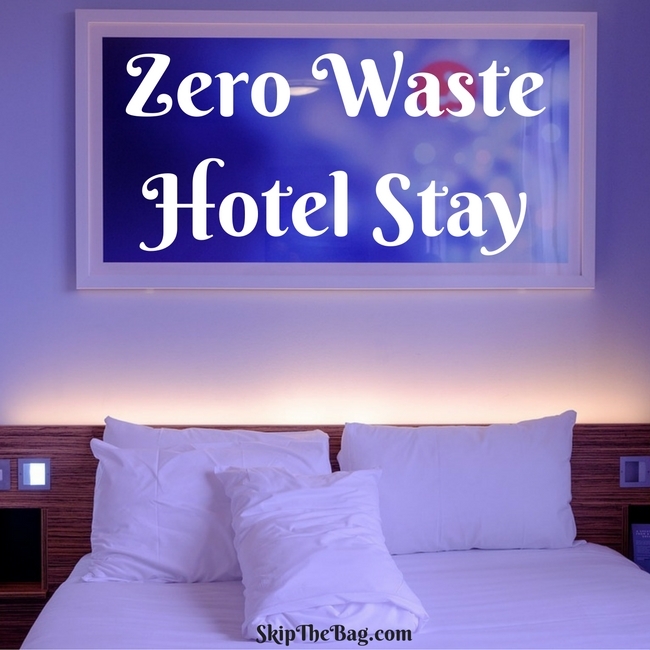 How do you prevent waste when staying in a hotel? *This is an affiliate link, see disclosures and privacy. Sounds like you guys have a picnic in your hotel room! How fun. Thanks for stopping by. Hi. Excellent tips! Found this on the Homesteader Hop and was immediately intrigued as summer travel season is upon us. We don't travel a lot, my love and I, but (in answer to your question) when we do, I take along homemade granola and yogurt for breakfast in the morning, so we can avoid all that waste and fatty food in the complimentary breakfast buffet. If I'm going to be gone several days, I'll usually take a small thermos, a liquid heating coil (the kind you put in a cup) and keep a little of the yogurt in a "mother" jar. Then I can heat the milk to lukewarm right in the thermos, add the mother, stir it up and cap tightly. Twelve hours later, I've got a new batch of yogurt. It's amazing how simple it is! Wow! That does sound easy. Yogurt is one of those things I've been tempted to make, but haven't quite jumped in to do it yet. If you can make it in a hotel room while traveling, certainly I can make it at home! You've inspired me. Thanks. Overnight ferry, that sounds like fun! Glad to see you are making an impact there too. I love to travel for fun and for business so these tips are great and easy to apply. I usually bring a lot of my own healthy food staples, silverware, thermos and stainless steel water bottles to hotels so I am able to make my own breakfast in the room. I also carry my own natural toiletries. 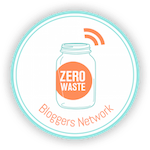 Thank you for sharing these wise and wonderful ways to prevent waste when staying in a hotel at the Healthy Happy Green and Natural Party Blog Hop. I'm pinning and sharing. Thanks for sharing! Sounds like you have a great system for traveling. Great tips. Haven't traveled for a long time so didn't really think about the waste that hotels produce. Congratulations on being featured on HHG&N blog hop. Pinning & tweeting! There can be so much waste created. Thanks for commenting and sharing! These are great tips! We usually do all of these things. 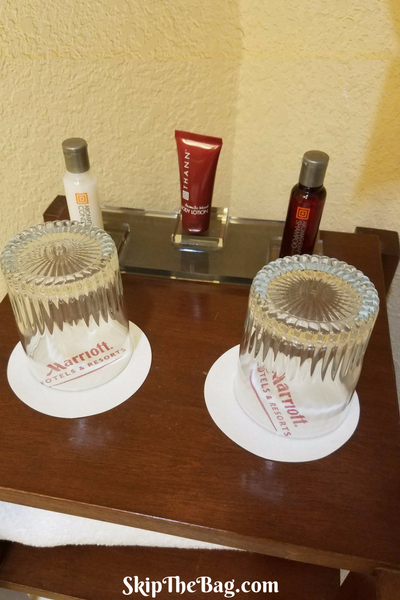 Another thing we do is--because we typically don't bring our own soap and therefore use the hotel's bar soap--we bring home the remainder of the bar and put it in our soap saver. Not getting your room cleaned during your stay is not just about reusing your linens. It also saves electricity because they're not vacuuming, and reduces waste of cleaning products they would use to clean surfaces that are already clean enough! If you see the cleaning people in the hall, tell them that your room does not need cleaning so they can check it off their list instead of repeatedly going back to see if your Do Not Disturb sign is off. Skipping cleaning is also a kindness to them=more rest time during their shift! Another way to reduce waste in a hotel stay is to make sure that when you leave your room, you turn off all the lights and set the thermostat to a temperature where the heat/AC won't run much. I didn't think about housekeeping having to keep checking on the room. I'll have to remember that in the future and let them know that we just won't be using their services. Thanks! Great tips. You define well in this post. Keep posting.